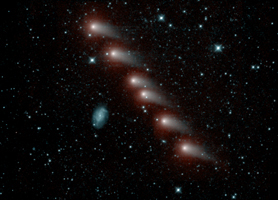 NASA's NEOWISE mission captured this series of pictures of comet C/2012 K1 -- also known as comet Pan-STARRS -- as it swept across our skies on May 20, 2014. The comet is relatively close to us -- it was only about 143 million miles (230 million kilometers) from Earth when this picture was taken. 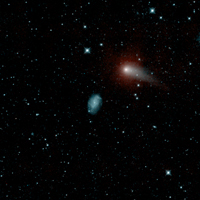 It is seen passing a much more distant spiral galaxy, called NGC 3726, which is about 55 million light-years from Earth, or 2 trillion times farther away than the comet. The image was made from data collected by the two infrared channels onboard the NEOWISE spacecraft, with the longer-wavelength channel (centered at 4.5 microns) mapped to red and the shorter-wavelength channel (3.4 microns) mapped to cyan. 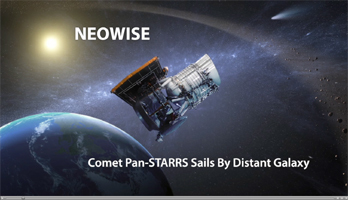 JPL manages NEOWISE for NASA's Science Mission Directorate at the agency's headquarters in Washington. The Space Dynamics Laboratory in Logan, Utah, built the science instrument. Ball Aerospace & Technologies Corp. of Boulder, Colo., built the spacecraft. Science operations and data processing take place at the Infrared Processing and Analysis Center at the California Institute of Technology in Pasadena. Caltech manages JPL for NASA.